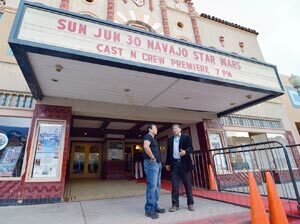 By Shondiin SilversmithThe original Star Wars: Episode IV--A New Hope premiered nationwide in 1977, but the characters based in a galaxy far, far away were brought a little closer to home during the Navajo dubbed film premiere on June 30 at the El Morro Theater. "It has a lot of humor in it," said 2012-2013 Miss Navajo Nation Leandra Thomas adding that she caught herself smiling throughout the whole movie. "I've never seen any of the Star Wars movies and it made a lot of sense seeing it once (and) in the Navajo language." The first character the audience is introduced to in the film is C-3P0 and R2-D2 as they walk through their spacecraft while it's being attacked. As the first line in Navajo is spoken by C-3P0 the audience erupts in cheers. "I was very very impressed how all the recordings came together," said Geri Hongeva-Camarillo, who played C-3P0. As the movie moved forward the crowd reaction remained high as the audience laughed and cheered as each character was introduced with a Navajo voice. "The tone in Navajo definitely makes a big difference compared to when you listen to something in English," said Donovan Hanley from White Cone, Ariz., who attended the premiere with his mother Ann Maree Hanley. "It was very cool and good representation. "Comment: For more on the subject, see The Best Indian Movies. Let me know when they have Navajo Lego Muppet Star Wars.... now THAT will be something.